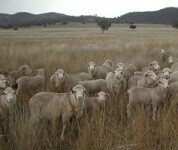 High weaning percentages for spring lambing ewes grazing native perennial grass based pastures on the North West Slopes of NSW can be achieved by integrating forage sources such as oats, lucerne or tropical grasses into the forage base, or providing protein and energy supplements at key times. 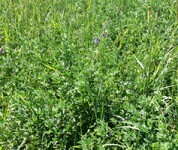 Adjusting stocking rates on at least a monthly or seasonal basis in relation to available pasture will increase pasture utilisation and reduce requirements for supplementary feed. 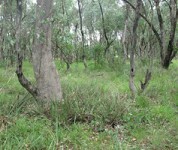 Conservation of Box-Gum Grassy Woodlands on the North West Slopes of NSW is best achieved through on-farm management of high quality remnant patches. Click on the key result heading to see full information. 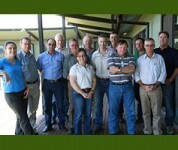 Weaning percentage increased from ~70 to >110%, where forage oats and/or lucerne were included in the feedbase. Studies conducted on-farm showed that parts of the farm that are not grazed by livestock are important for creating habitat variety, and are best targeted for protection, restoration and regeneration. Woodland vegetation that was not grazed by livestock made a large contribution to regional plant diversity, despite its very limited extent in the landscape. 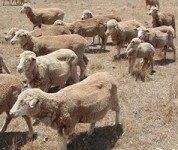 Native pastures regenerating after cultivation re-established total species densities comparable with those of uncultivated native pastures 10–25 years after the last cultivation, and comparable native species densities 15–30 years after the last cultivation. Data collected on-farm showed that the composition of grazed native pastures was quite uniform, with species comprised of a limited suite of grazing-tolerant, native and exotic grasses and forbs. Our data also suggest that the relationship between livestock grazing and plant conservation is antagonistic. Northern NSW has a variable climate compared with most other parts of Australia, receiving weather systems from both northern and southern influences….